A Star Shadow Box for Lovers! I started learning how to make video tutorials because I knew the assembly of my Star Shadow box would be much easier for many people if they could just see me do it. Those side brackets are confusing and yet so simple! I decided that I would design a new shadow box appropriate for the season as I created the tutorial. 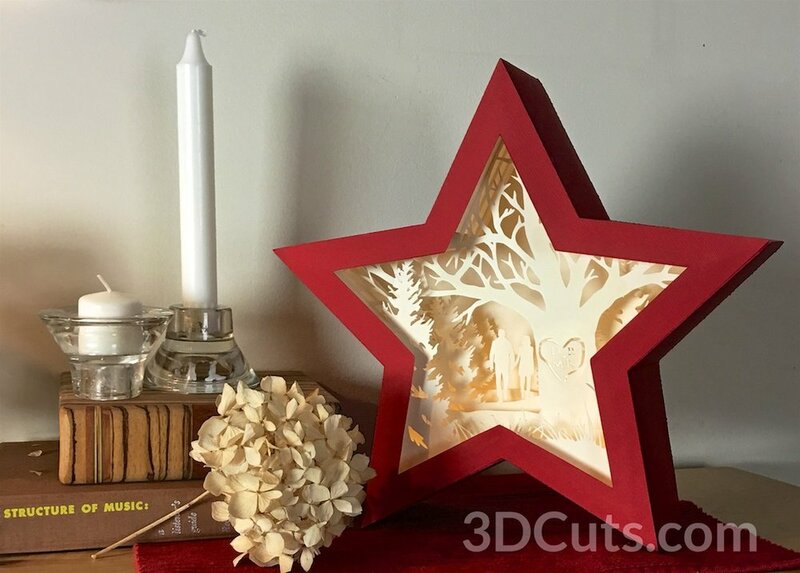 Today I am introducing Heart Tree Star Shadow Box featuring the classic theme of a couple holding hands and a tree with a carved heart. There are several special features associated with this project. The first is that the initials in the heart are customizable. The download of the cutting file includes all the letters of the alphabet in a carved font for you to insert ti highlight the special people in your life. And the second exciting item is that I have created a 4 part video tutorial to help you in the assemble of this shadow box. The tutorial is universal so that it will also help those of you with my other 2 shadow box files - Deer in the Forest and Horses in the Pasture.